At the retreat I did for some folks in Georgia this weekend, the woman who arranged it hired an extraordinary cook and her husband to prepare our completely organic, vegetarian meals. In this I met one of the most unique and interesting families I have ever encountered. The wife is from Japan, and has a sweet and ebullient nature. The husband is from Georgia, a musician, carpenter, organic farmer and avid reader who it seemed you can have an interesting conversation with on just about any subject. They have three friendly, charming, talented children. The family has an organic farm where they grow all of the vegetables they use in the cooking they do, and raise chickens for eggs. The cuisine they prepare is completely Japanese in flavoring, selection and presentation. Yet the greens and vegetables are those used in home style southern cooking. They looked familiar to me from eating at the tables of my Appalachian friends, while tasting like I was dining at one of the finest Japanese restaurants. He, the Dad, has dark brown eyes and hair, so I was curious if there might be Japanese somewhere in his lineage. I asked him about his ancestry, and he said, with a gleam, “My ancestors come from Africa.” I understood his point perfectly. All of our ancestors come from Africa, the birthplace of our species. We’re all one family. This weekend I got to meet distant Jappalachian cousins. Delightful. This entry was posted on May 30, 2010 at 10:53 pm and is filed under Uncategorized. You can follow any responses to this entry through the RSS 2.0 feed. You can leave a response, or trackback from your own site. This is so cool! I have a friend here who is a landscape designer and her new thing is “Jappalachian” design: using Japanese garden designs with native Appalachian plants. Wow, I didn’t know any one else used the term! If your friend has a website would you e-mail it to me, and I’ll send it along to that family. They may be interested to know about her. Thank you Tayria for your kind words! 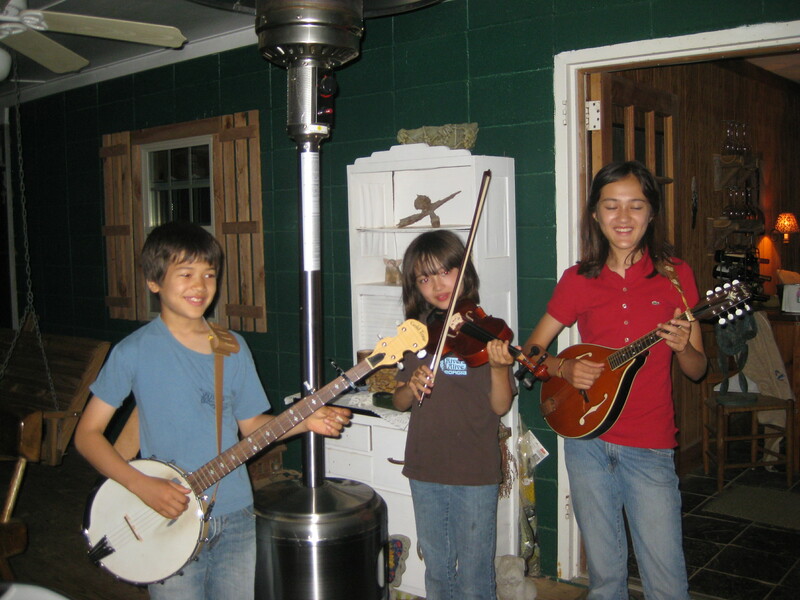 Our kids, Sarah (mandolin), Etowah (banjo), and Selu (fiddle) really had a good time playing for you all and meeting everyone. It sure was an even exchange of creative energy! If anyone is down this way in northern Georgia (Dahlonega), please look us up! We have garden dinners every third Saturday and our “Garden Bugs and River Critters Club every second Saturday. Best wishes to everyone in our Southern Appalchian Bio-Region, Katuah. Joe, I’m so glad you saw this and appreciated it. I didn’t name your names for the sake of anonymity until I got a chance to be in touch with you and ask, but am so pleased you wanted to tell people about your family’s activities and make invitations. So wonderful. I hope to make it down for some of your regular meal offerings, and want to share more about what you are doing as I can. I’m so inspired by you.